It was only a few weeks ago when we were looking at the buds appearing on the trees and now they are opening up and showing us their beautiful new leaves. 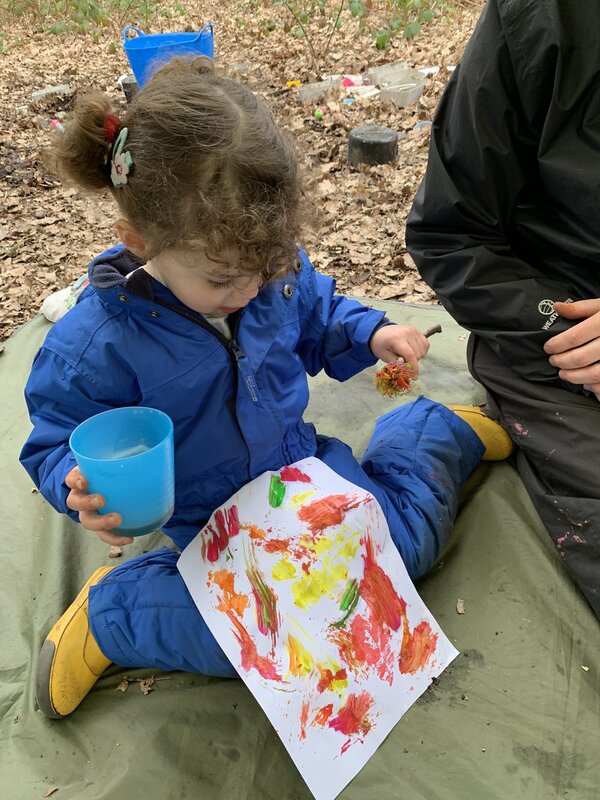 It turns out there are such a lot of different greens and browns in the woods and our Parent and Toddlers all did a great job of sorting all the natural objects into their different shades of colour. The children are becoming very familiar with the different flora in the woodland and they were showing great observational skills today in comparing the colours. We also had a go at making today charcoal from Willow sticks. This process involves burning without oxygen in our tin with holes in. This allows the oxygen inside the box to escape. Charcoal is lots of fun to draw with and is so easy to make. Last but not least we had the opportunity for the children to have a go at wet felting today. It is a process where felt is made from wool tops. The wool has to be pulled apart and then layered over each other, before using soapy water and bubble wrap to aggravate the fibres and make them form the felt. The results the children produced today were fantastic. Remember if the stick gets fluffy again, you can rework it with some soapy water and your bubble wrap.